For me, certain projects require a bit of a push. There’s almost always one all-out, late-night, knit-fest to get through some part of a project. 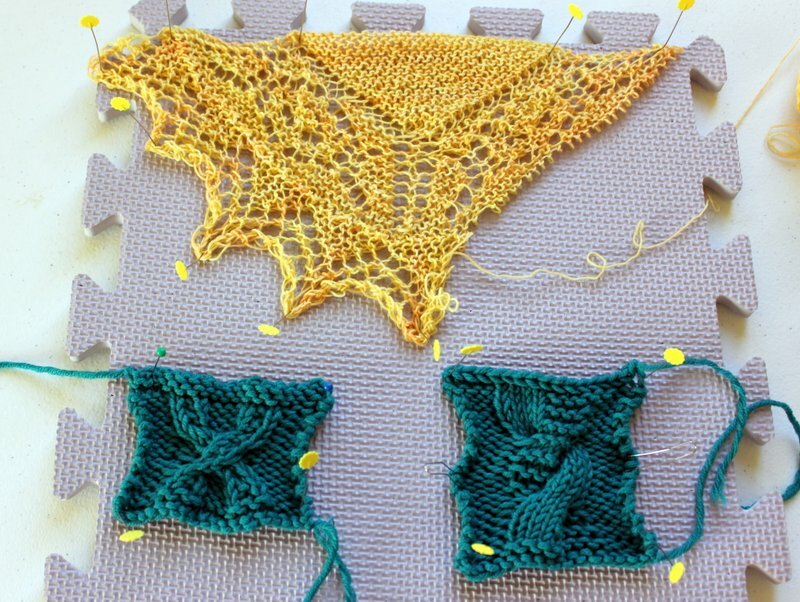 Last night was the endurance portion of my Overdyed Cypress vest knitting, but it paid off. On the blocking boards! Click for project page. The back and front of my vest are complete, similarly-shaped (the back is purposefully narrower than the front), and vaguely garment-like. Once they dry, I will seam them up and then it’ll be just a matter of adding armhole and neckline trim before Saturday. I’m a little worried that the pieces are too long (I didn’t make row gauge and tried to compensate for that) but we’ll just have to wait and see about the fit. Sometimes, staying up into the wee hours to power through shoulder shaping sections is totally worth it. Garnet Tonic, click for project page. Meanwhile, the cowl that I’m so in love with is progressing, slowly but surely. I’ve forgotten how much I like working a simple lace pattern back and forth on straight needles. No shaping to fret about, it doesn’t get longer any as you go, and there’s no annoying circular needle join to contend with. Pure pleasure. Lendrum Falkland wool, click for handspun page. I’m still chugging away on the never-ending-pound of Falkland wool that I used for my ply experiment. 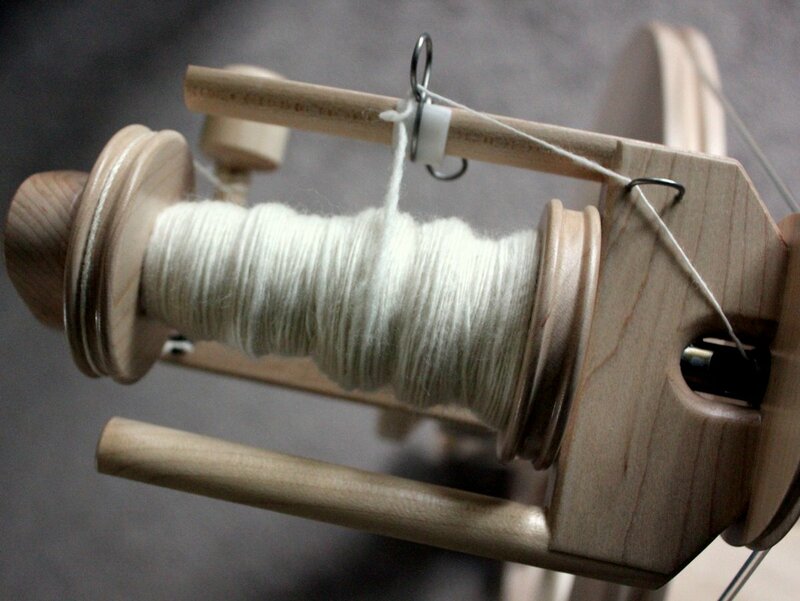 Don’t get me wrong, it’s a delightful fiber and a joy to spin, I’m just itching to make some big fluffy colorful singles yarns, and this flow of fine white fiber is not abating. On an entirely different note, does anyone have any good teaching resources for brand new knitters? I’ve volunteered to teach a bunch of middle-to-high-school-aged girls how to knit this Friday, and I haven’t had a chance to do much searching for materials yet. We’re going to be making Harry Potter scarves, in either striped garter stitch or 1×1 rib (their choice) and I’ll have some samples to show, but it would be great to have some illustrations and written directions that they could take home with them on a handout. If anyone knows of some good resources, please let me know! A terrible thing happens when your December is full of work/life deadlines: you kind of miss the whole thing. You get a little bit like “Huh? Christmas is coming? When is that happening again? Let me check my calender…” despite the many images of holiday cheer flooding all forms of media. You feel a bit like it’s not really happening. My favorite part of the holidays is the anticipation and the build-up beforehand, and because I basically plowed through November preparing for the GRE and am now barreling through December with grad school applications and work deadlines, I’m left blinking in confusion at how it could possibly be December 10th already. We did get the tree decorated, though, Limulus style. Falkland on my new Lendrum. Click for handspun page. So I’ve been taking a few minutes a day to spin on my new wheel. Nothing ambitious, no grand plan, just working my way through the 17 oz of Falkland wool I got from Webs and loving the thin, even single I’m spinning with hardly any effort. 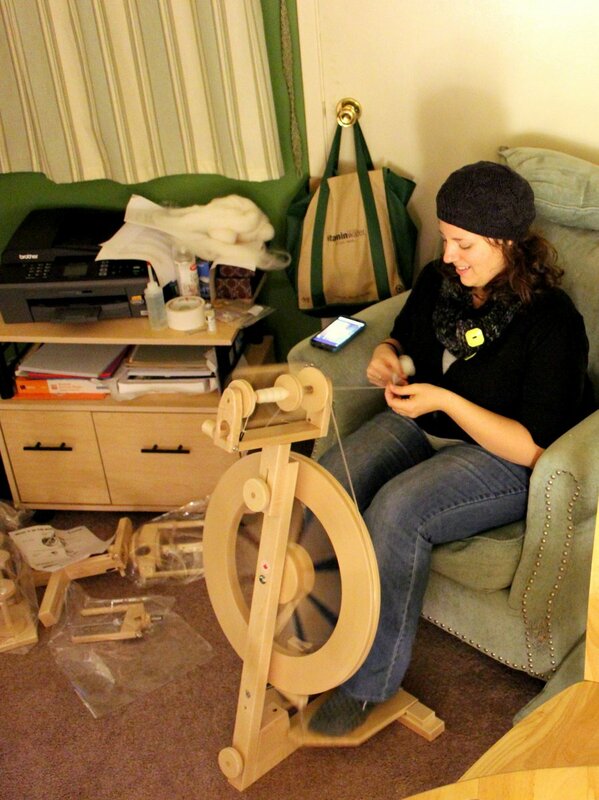 That’s my second bobbin, I’ve spun up about 5 oz already. 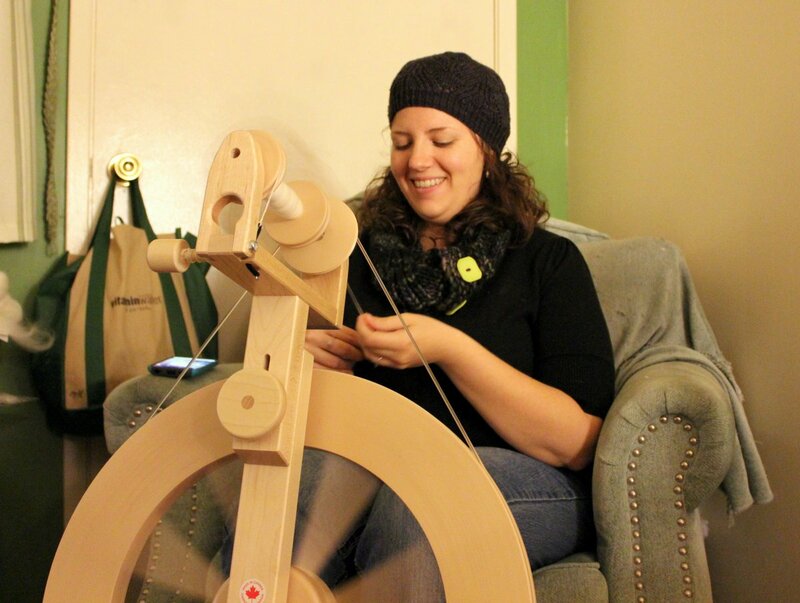 Sherrill from The 1764 Shepherdess (Baabonnybelle on Instagram) is proposing a #spin15in15 hashtag to spin for 15 minutes a day starting in January. I intend to use it. New design in the works. Click for project page. So here’s to slowing down, tackling the to-do list one thing at a time, and letting my dreams of exciting and colorful future projects and endeavors wait until January, because I’m determined to pay attention to December before it’s gone. What are you working on this week? Nobody wants you, squirrel cage swift thing! I finally received my brand new Lendrum DT! (Previous posts in my search for a new wheel are here and here.) As evidenced in the photos below, I didn’t even remove my knitwear after walking in the door before sitting down to spin on it. Guys, it’s so lovely to work with. New wheel on the go. 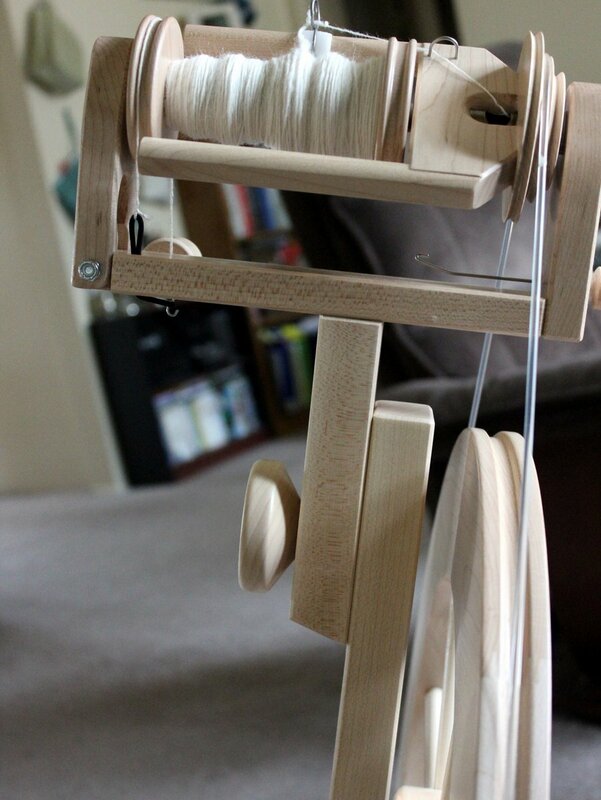 The treadles are extremely comfortable, it was simple to put together and seems easy to maintain (I’ve only oiled the flyer shaft, everything else is contained), the wood is gorgeous in person and it is spinning up my free pound of Falkland wool nice and smoothly. I’m unreasonably excited to try out all the different drive ratios the complete package came with (the regular flyer, fast flyer, and jumbo flyer each have 3) and I’m kind of enthralled with the little sliding hook mechanism (rather than individual hooks on the flyer). 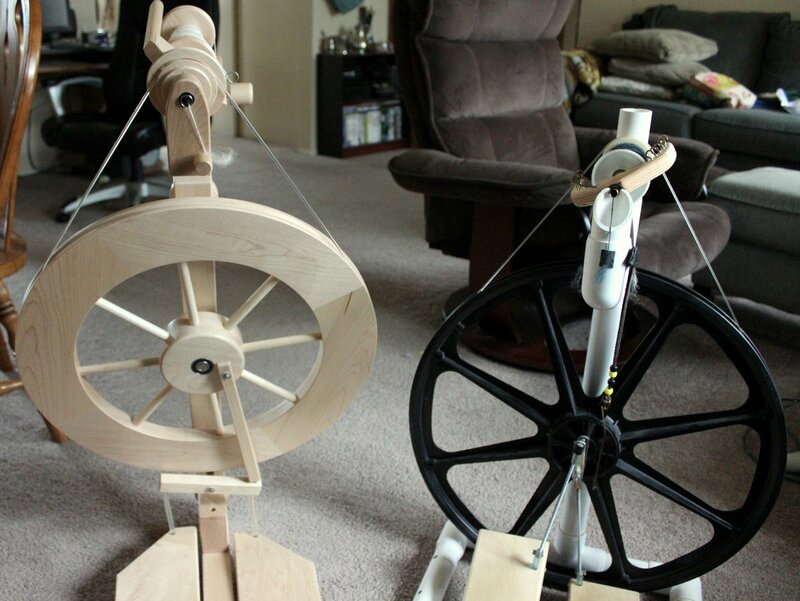 The Majacraft Pioneer I tried had a slidey bit and was lovely to treadle as well, but I couldn’t get over the delta orifice on that wheel, and much prefer the wood used in the Lendrum anyway. The back of the maiden. 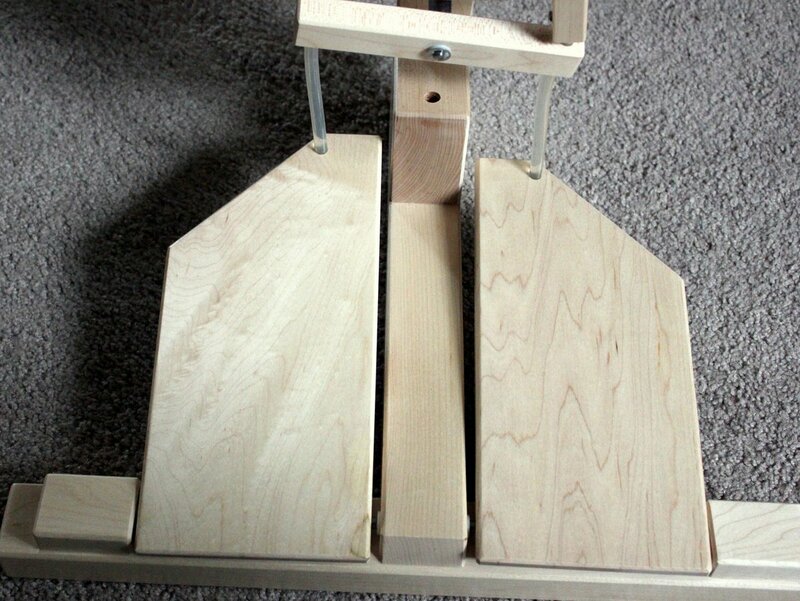 Pretty wood grain on treadles. After a weekend that involved an obnoxious amount of verbal and quantitative reasoning questions (yay GREs! ), staying-up-until-3am-statement-of-purpose-essay-writing, copious grad school application activities, and general brain fatigue, I’m really looking forward to spending some free time chillaxin’ with my new spinning buddy. 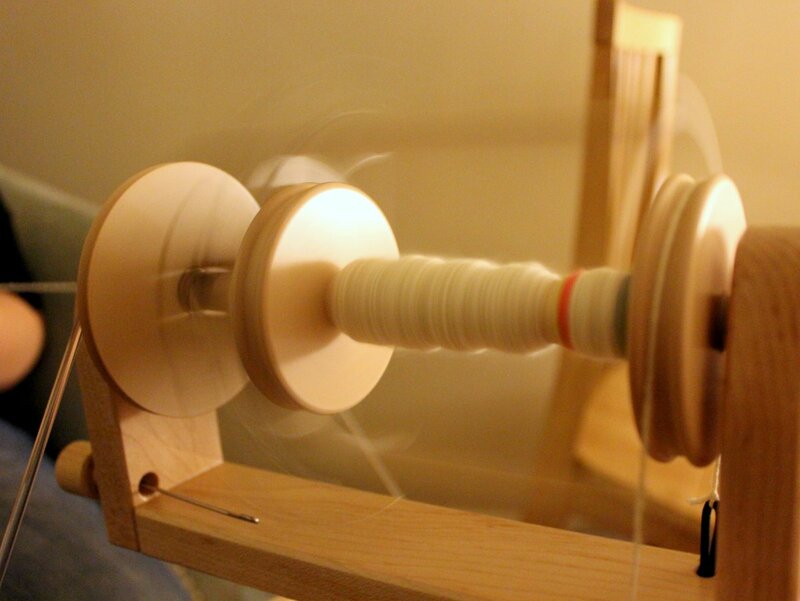 (I’m barely resisting giving a name to this new spinning buddy. 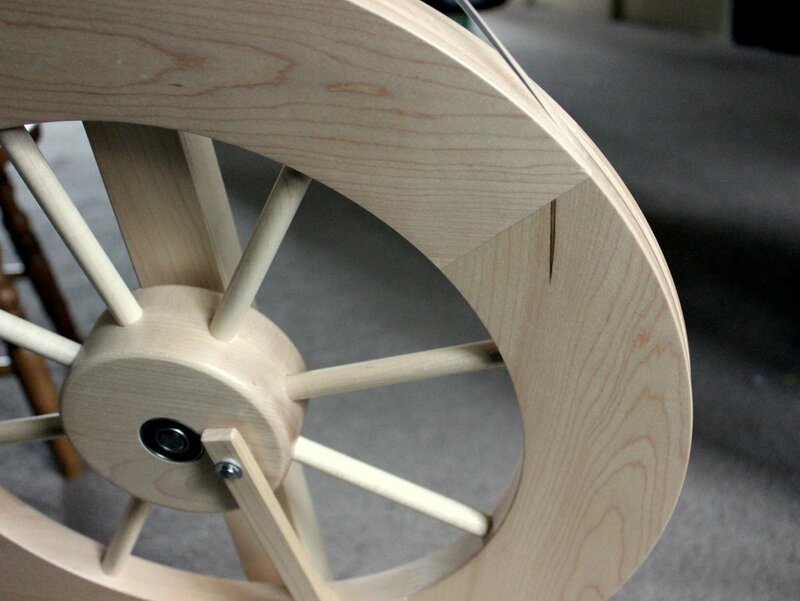 I’ve always thought that naming wheels and spindles was sort of odd, but for some reason I’m feeling the urge. Please stop me.) Due to all of the craziness around here lately and a yoga-induced strained back muscle (really! ), I haven’t been doing much knitting, but I’ll document the little WIP progress I did manage to make this week anyway. Blurry pic, sorry! Click for project page. Just a couple more rows added to my (former) #NaKniSweMo sweater. I’ll get there, eventually! Slow and steady with this one. Foxfire Fibre Upland Wool & Alpaca. Click for project page. The texture of this cowl reminds me of a nice, frothy chai tea latte drink. I started this on Thanksgiving so I’d have something smaller than a sweater to carry with me on our holiday travels. The yarn is a natural tan wool, spun woolen for optimal loft and fuzziness. It reminds me of an even airier Malabrigo worsted, it is a thick yet lightweight singles yarn. My skein is untagged, but I purchased it at my knitting guild when Barbara from Foxfire Fiber & Designs (who wrote an excellent book, Adventures in Yarn Farming) came to give a talk. I believe this yarn is her Upland Wool & Alpaca blend, technically a DK weight but I’m knitting it on size 9’s for a loftier fabric. I’m designing as I go, using a variation of the stitch I explored in the baby hat I finished last week. We’ll see how it turns out! Countess Ablaze Pertrol BFL. Click for handspun page. Just because I have a new wheel, doesn’t mean I’m going to completely ignore my old one! 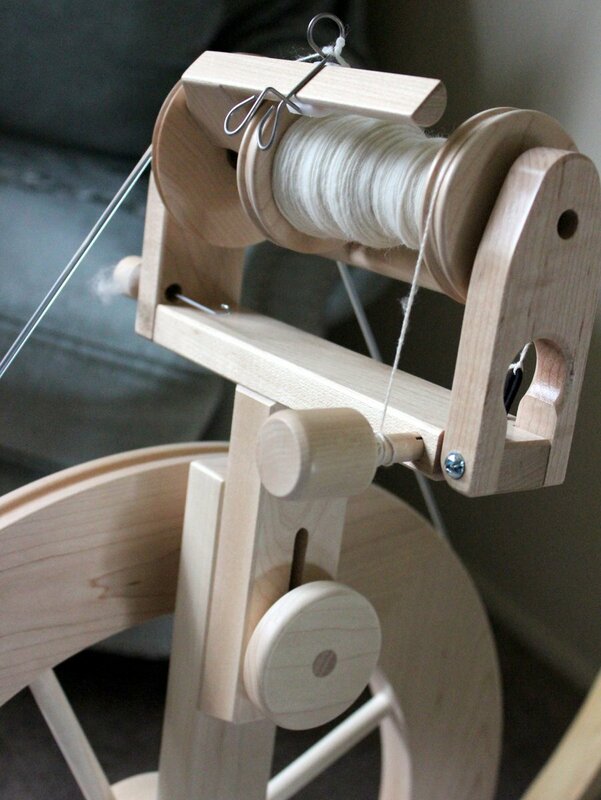 The Babe is still great for spinning longwools, plying, and any art yarns that require strong pull or special techniques. Besides, I intend to use a bunch of random skeins of BFL handspun in one project, so I should probably continue to use the same tool when spinning them up. Wooldancer 19.5 Micron Merino. Click for handspun page. I finished the little sample skein I was spinning on my Jenkins Finch (pics later, I forgot!) and started this shockingly pink braid of ultra fine Merino wool. I’m surprised by how much I love this wee spindle and this unabashedly pink fiber. It’s so far outside my normal color palette, but it’s really gorgeous in person. Since the singles are very thin, I split the braid into four equal bits and am planning to spin a 4-ply. Since the colors are not distinct and will undoubtedly jumble up with plying, I’m picturing the finished yarn to have a nicely heathered effect. What have you been working on lately? Am I the only one in the middle of crazy deadlines? I’m hoping they let up soon so I can actually relax a little and get in the holiday spirit before Christmas comes! Magical things are happening around here: after just 5 days of dedicated knitting, I have about 20% of my #NaKniSweMo sweater finished already! BMFA Twisted, overdyed. Click for project page. It’s knit in pieces, just a back and a front, so rows are relatively short. There’s no waist shaping, so once you get going you can power through without worry until the armholes. There is minimal armhole shaping: some increasing, some more knitting, and then some binding off (I think, haven’t gotten that far yet). The stitch pattern is supremely simple, but still interesting, switching between stockinette and 1×1 rib every couple of rows. In short, this little vest-y pullover is ticking all my buttons right now, and I’m loving it. VG Zaftig, colorways Russian Sage and Kiss of Cabernet. Click for project page. 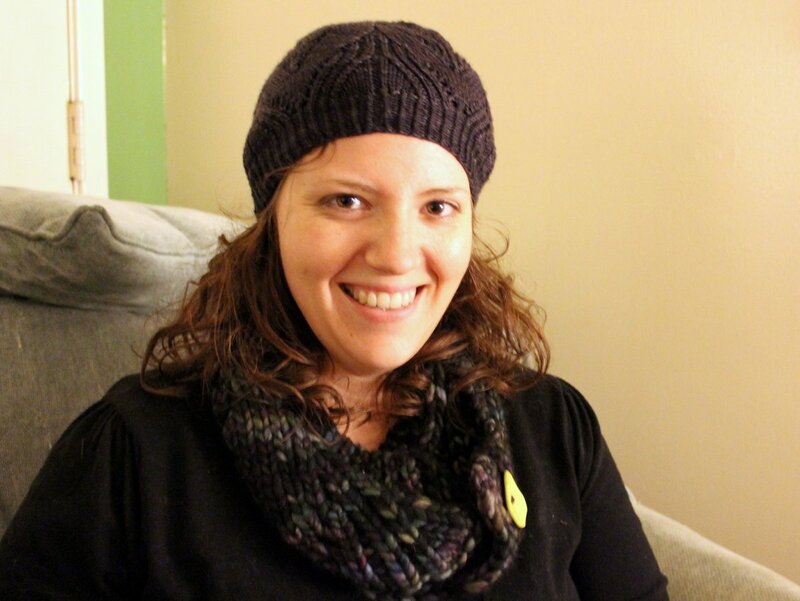 My Lucy Hat is off the needles and in the process of blocking, and I already adore it. Ends need to be woven in and the brim needs to be turned up, but those will just take a few moments once dry. Hopefully I can get some modeled shots for Friday, the hat is super cute on. The only thing I’ve done besides the sweater (and sneaking in the finish of the Lucy Hat) is spin a bit on my Russian spindle. I’m still loving the way these batts are working up. 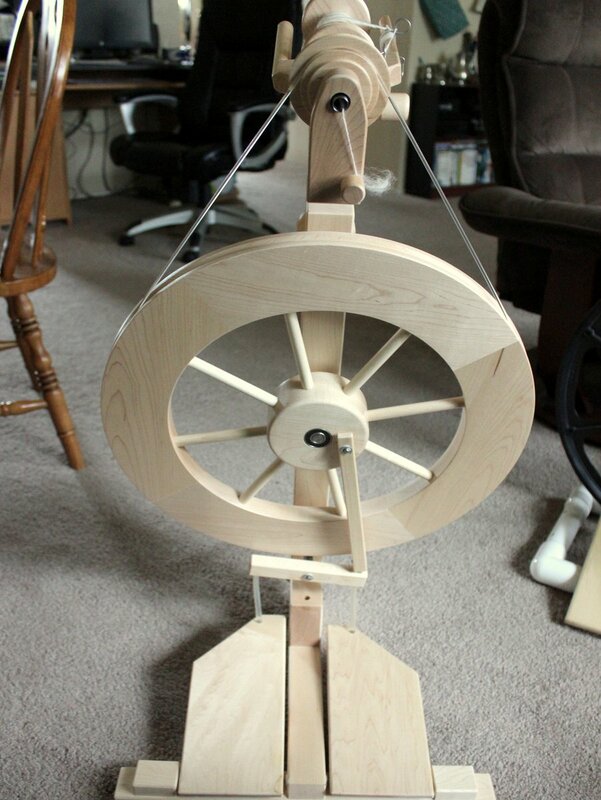 I hope you like looking at that photo above because this project is going to look very similar for quite some time (support spindling makes for very fine singles = very long spinning projects). What have you been up to this week? Do you find that sweater or accessory patterns with certain characteristics work better for you than others?